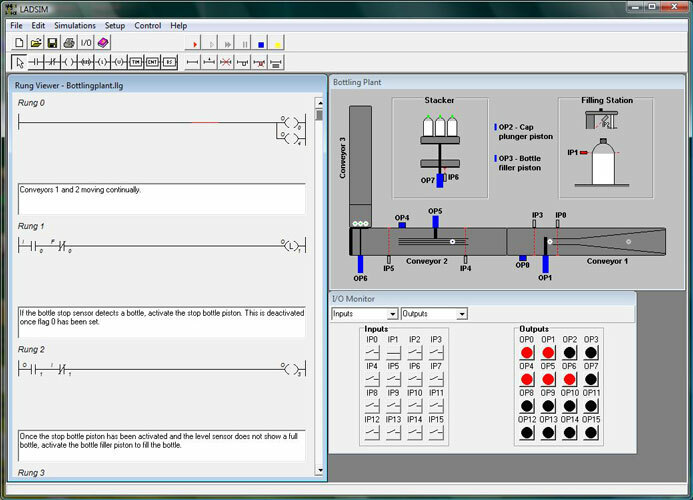 LADSIM is a fully functional ladder logic design and PLC simulation software program that incorporates the functions used in PLC ladder programming. LADSIM uses the PC as a virtual PLC. LADSIM includes a visual editing environment for graphical programming. 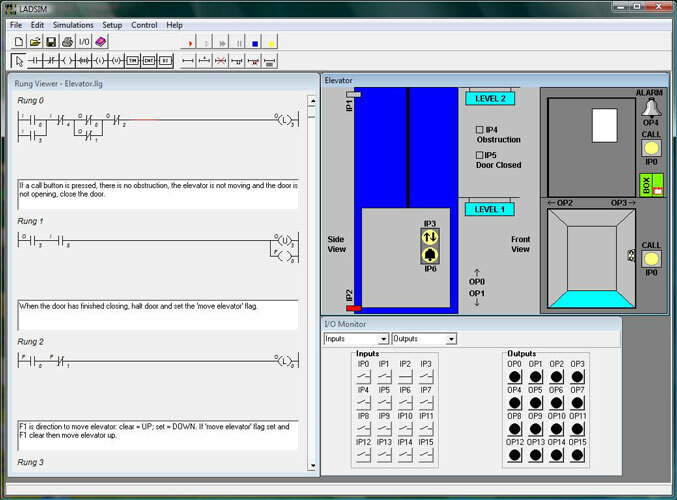 A simple ‘drag and drop’ method is used to add functions to the ladder rung, and comments can be added to each rung for documentation purposes. 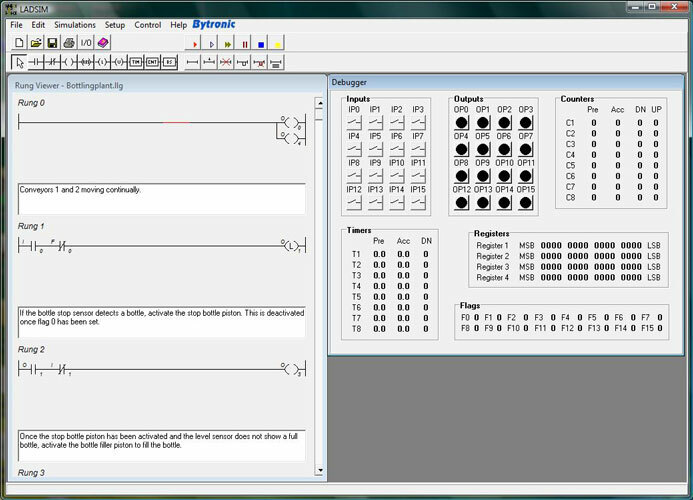 LADSIM functions include inputs, outputs, timers, counters, flags and shift registers. An interactive debugger is included allowing the program to be tested before being used to control a specific application. LADSIM has eight internal simulations; Annunciator, Traffic Light, Car Park, Elevator, Drinks Machine, Packing Line, Bottling Plant, and the ICT3. Each simulation is designed to aid and test knowledge of programming in ladder logic. LADSIM has the ability to be connected to external devices, through a suitable interface. 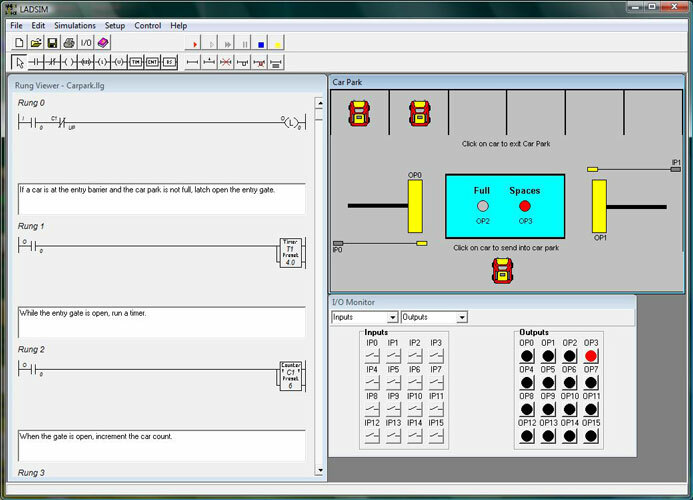 The student can start with the internal simulations and then move onto the ICT3 simulation once completed it is then possible to connect an actual ICT3, using an interface card and control this through the real I/O. The courseware begins with a general introduction to PLCs, the various programming methods available and the fundamentals of ladder logic programming and then moves onto the functions of LADSIM. Developing programs to monitor and control each of the simulations is part of the curriculum coverage.